On the eve of Mother’s Day, I thought it would be important to salute those amazing women who are influential in the lives of their nieces and nephews but have not given birth to a child. I know lots of these important women who have been nicknamed PANKs, Professional Aunts No Kids. They are actively involved in the lives of children around them. In fact, one in five women is a PANK, or approximately 23 million Americans. PANKs are roughly half of all the women who are not a mother or grandmother. This group is actually growing as women are choosing to stay single or marry later. PANKs spend $9 billion on toys and gifts for children annually, according to “The Power of the PANK”, a study by Savvy Auntie and public relations firm Weber Shandwich. PANKs tend to have about the same income as the average woman, but they have more disposable income because they do not have children and are more likely to be single. 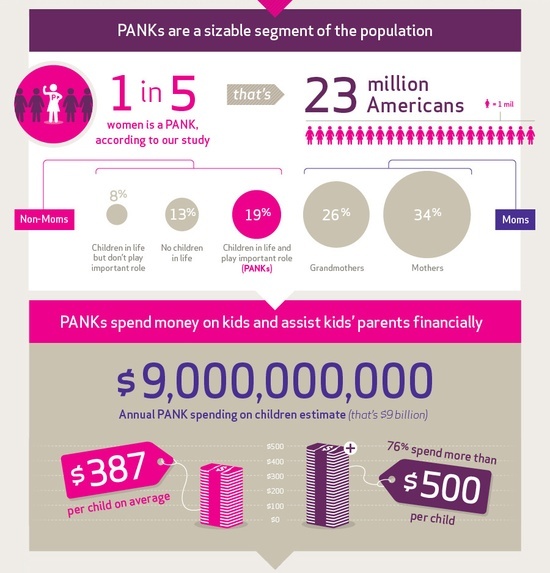 PANKs estimate that they spent an average of $387 on each child in their lives during the past year, with 76% having spent more than $500 per child. Additionally, PANKs are younger. The average age of a PANK is 36 (vs. 46 years for overall women), a highly desirable age group for marketers because it suggests that PANKs potentially have a network of friends and family members with growing families. This important group of women are also mighty among social media influencers. PANKs tend to spend more time on social media than women in general. PANKs are great at sharing information about clothing, vacation/travel, websites/social networks sites, and products for digital devices. They also index higher on traditionally “mom” categories, such as groceries/food and beverages, household appliances and home decorating goods, and knowledgeable about more male-dominated areas of expertise: electronics, automobiles/other vehicles, life and property insurance, and financial investments/services. Some 43% of PANKs say advertising and marketing is not geared to them, and half of them say that society does not acknowledge them. Imagine what would happen if advertisers acknowledged this group. This important demographic would be extremely loyal to brands that reach out to them. You are currently reading Marketing to Women: Power to the PANKs at The Lipstick Economy.